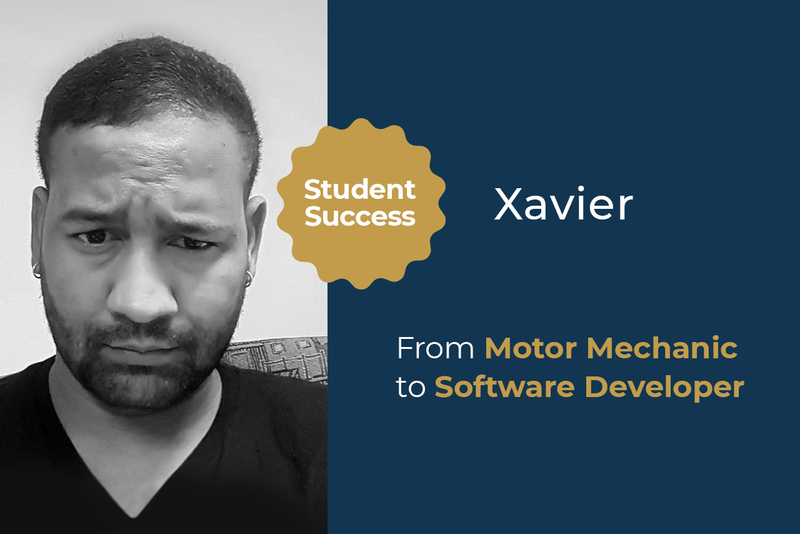 Xavier completed his diploma in computer programming in 2010, yet struggled to land a job in tech and found himself working as a motor mechanic instead. He acknowledged that if he wanted to pursue a career as a developer, he needed to study further as his current diploma didn’t seem to meet recruiters’ expectations. He pursued HyperionDev’s Certified Software Developer and Full Stack Web Developer course. Today, he’s working as a developer for an IT consulting company. Read more of Xavier’s road to success below. What inspired you to take HyperionDev’s Certified Software Developer & Full Stack Web Developer courses? My journey to get into tech was actually quite difficult. I tried to start my career in 2010 after graduating with a diploma in computer programming. Most employers wanted work experience. Then I heard about the CiTi program in partnership with HyperionDev and they were offering coding programs. This really jump-started my IT career. Was your reason for choosing a course at HyperionDev related to changing careers or upskilling? It was a mix of both – I really wanted to both upskill as well as learn new languages, such as C# and Python. I really wanted to add to the knowledge I had gained during my computer science diploma. What work were you doing prior to your course? I was in the mechanical industry working as a motor mechanic. And I realized one day that I shouldn’t be working there and so I decided to make a change. A career in coding seemed way more fulfilling than my mechanic job. You completed your diploma in computer programming in 2010. What made you decide to pursue a course with HyperionDev in addition to your diploma? I knew that if I had more experience and studied more programming languages, this would provide me with a better chance in starting my career in IT. How long did it take you to get a job in the industry after graduating from your course with HyperionDev? Where was the job? It only took me about 2 weeks and I found a job with Pepkor IT. I was really excited to see how quickly I was able to find a job in programming especially since it took me so long to get my career in IT started after I completed my studies. You currently work as a web developer at Pepkor IT. What is your average day like? I work as part of the operations team and we provide other companies and clients tech and web page support. We have frequent meetings with clients to determine their needs and once we determine what they are looking for, we help them fulfill their goals. How would you say this course with HyperionDev has prepared you for this role? The course with HyperionDev provided me with the foundation of programming – knowing why you do what you’re doing. It taught me the basics and knowledge of coding. Not to mention, the documentation was awesome. Tell us about your experience of the personal mentorship at HyperionDev. I had Sox as my mentor and he was really cool and helpful when I needed him. If I had trouble with any of the content or tasks, he would guide me in the right direction. What is your favorite thing about coding, programming and web development? I really enjoy being able to create something out of nothing. The creativity aspect behind coding allows you to build anything and create your own little world. What advice would you give to people wanting to become developers? I would tell them that it’s not the code or the languages you need to know. It’s more about the principles and understanding the basics. If you’re able to just read the code you’ll be set for life.